As a modern essayist Arthur is self-deprecating when he differentiates himself from preconceived notions that often lead to staid, academic forms. The collection should not be viewed as a series of scholarly exercises, but more as moments of self-expression. There is no set structure or formula to Arthur’s work. Each essay follows a thread of thought through various tangents and revisits, some exploring the titular concern immediately, some after a lengthy preamble, and some sporadically. But describing his essay structures as ‘loose’ is not a criticism; in fact it is what allows each essay to drift towards the point it needs to and when it wants to. This fluid nature means that essays can explore multiple themes in the space of a few pages, each essay a complex web of interrelated thoughts focused around a core, hummingbird moment. we’re all obedient to a magpie’s-eye imperative that makes us seek out whatever shines for us most brightly. And this makes me unrepentant about fixating on this brief passage in Darwin’s writings where he records his killing of the fox. Arthur’s work is painfully self-aware, justifying itself and the forms it takes. Here the symbolism of the ‘magpie’s-eye’ has been set up as a description of his imaginative assembly of interesting events. It is a style of curation embodied in all of these essays ‒ shiny moments such as the casual killing of a fox by a beloved naturalist are showcased, but then made to seem almost incidental as what really matters are the thoughts that surround those episodes. This complex dance allows the writer to explore the cause and effect that lead up to instances of shocking epiphany, and how they affect not only his understanding of the world, but also how that comprehension translates into the very form of what he has been writing. It is a moment familiar to most people, either from their childhood memories of witnessing death for the first time, or of being an adult helping a child through such experiences in later life. Such powerful moments like this leaven the complexities and make them more emotionally resonant. 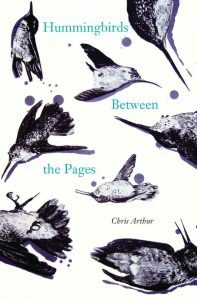 There is something for everyone in Chris Arthur’s Hummingbirds Between the Pages. His work will appeal to dreamers and the worldly-wise, fans of the poetic and admirers of the lyrical. This collection will take you on several intricately crafted journeys. Why not let it?